Look Sharp, Sconnie - Midwestern Fashion Nerd, Chronic Over-thinker: How Low Can You Go? One of my favorite designers, palette wise, would have to be Chloé. 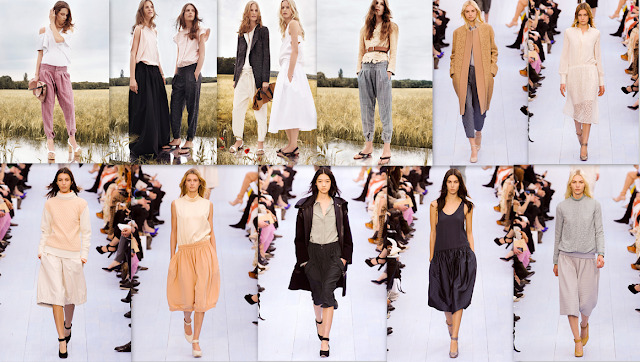 Even when the sagging silhouettes challenge my go to high-waisted safe place, there's something so effortlessly elegant about the drooping and flowing that can be found in both the Fall '12 & Resort '13 collections. I dropped the waistline, loosened the shirt, and did a little Chloé interpretation of my own. So here I bring you two looks: 1 fem, 1 masc. everything with a grain of salt. Anyhow. I think that I may have found a new casual go-to. I'm still able to balance out my "long torso" (a fact of which I'm notified disconcertingly often) - even with the lowered waistline. I'm also liking how the trend comes fully equipped with a certain I-don't-care vibe, and allows me to maintain my boring earthy color palette. So ultimately - not so outside of my comfort zone. But alas, for the sake of the post, let us just pretend. Are you folks committed to the high-waist, or are you low-riders? Does it change with the years? Chloe torments me on a fairly regular basis ... sigh. I think you really nailed the Chloe-channeling here, esp with the fem look. you both look so pretty! ps I love G"s long tweed? blazer~~ xO! Love your skirt it's the perfect length. You are doing an amazing work with your blog honey. I adore it!!! You look fantastic!!!!! I love both looks! you look amazing! Thanks for visiting my blog and your sweet comments :) have a nice week!